It started simply. A whisper of the Holy Spirit. A whisper in my spirit telling me to pray for the Police Officers in the Police vehicle in front of me. I obeyed and prayed. It was a simple prayer that God would protect them as they protect us. A simple prayer that their hearts would be filled with love and compassion. A simple prayer that they would act with wisdom. It started in June, after our city lost a Police Officer in the line of duty. 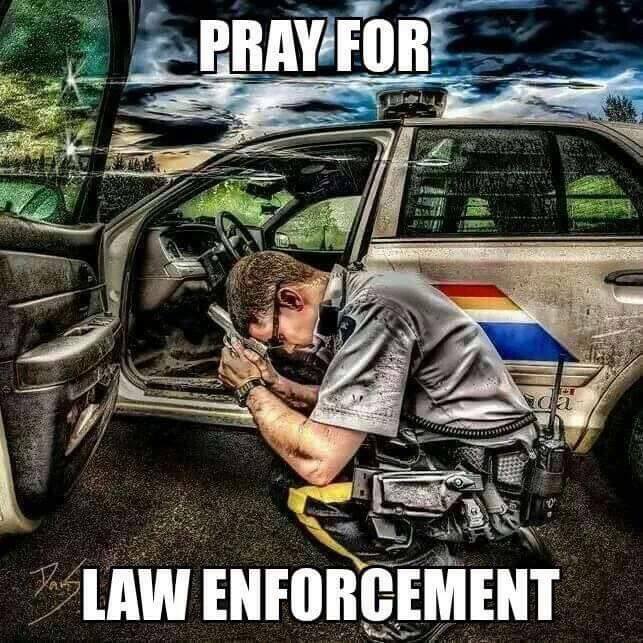 God started prompting me to pray for city officers, county sheriff deputies and state police officers. It has become a ministry in my every day life. I used to drive around the city and rarely see a Law Enforcement Officer and now I see them ALL the time. I used to get nervous when I would see a police vehicle. I now am glad when God brings them across my path, because I know I have a ministry to pray for these heroes. I am glad when I don’t go a mile without seeing an officer. The more I see, the more I get to cover with prayer. Always a good thing. In these times of chaos and evil, these men and women never know what they are walking into. A simple call can turn into a loss of life. They put their lives on the line to protect and serve their communities and if my simple prayer can protect them in the line of duty then I am happy. They will never know, as they sit in their car in front of me, drive past me, or sit in their spots looking for traffic violators that a 48 year old, ordinary woman driving a 12 year old SUV has just covered them in prayer. That’s okay. It doesn’t matter. All that matters is that I have the privilege to pray, partnering with God in changing the world, one community at a time. I don’t know what God is calling you to do as you go about your life. I don’t know what ordinary ministry God has called you to, but nothing is ever to simple when it comes to obeying God. That simple thing that God has called you to do could keep someone safe, could give someone hope, could bring someone to Jesus. Some of us are not called to the billion dollar mega church ministries that get tons of media attention. Some of us (and that includes me) are called to simple ministries in our communities that may actually do more to change the world than all of those mega ministries put together. Do that simple thing that God is calling you to do. Simple ministries can change communities, when you and I obey God. What is your simple ministry? What small thing is God asking you do to do to change your community? Will you obey? Will you do what God is asking you to do to make a difference in your community?